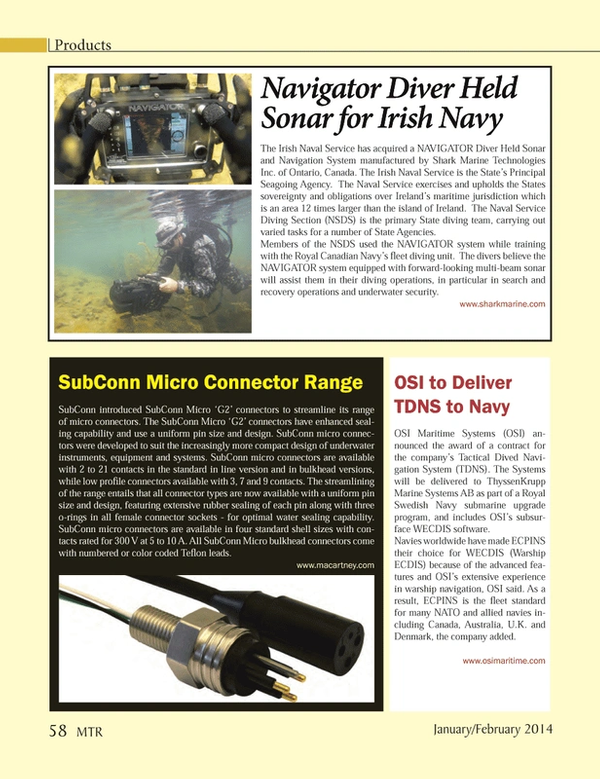 The Irish Naval Service has acquired a NAVIGATOR Diver Held Sonar and Navigation System manufactured by Shark Marine Technologies Inc. of Ontario, Canada. The Irish Naval Service is the State’s Principal Seagoing Agency. The Naval Service exercises and upholds the States sovereignty and obligations over Ireland’s maritime jurisdiction which is an area 12 times larger than the island of Ireland. The Naval Service Diving Section (NSDS) is the primary State diving team, carrying out varied tasks for a number of State Agencies. Members of the NSDS used the NAVIGATOR system while training with the Royal Canadian Navy’s fleet diving unit. The divers believe the NAVIGATOR system equipped with forward-looking multi-beam sonar will assist them in their diving operations, in particular in search and recovery operations and underwater security.